8K Player acts as a top Bluray/DVD player, HEIC viewer, SD/HD/4K video player, ISO player, audio/music player, which contains all media playback solutions you need for your leisure entertainment, and supports video looping/recording, gif making, etc. 8K Player the best app to play all media contents on Windows (10). As a top Blu-ray player, it is able to play any Blu-ray disc released in any region. Meanwhile, it lets you enjoy lifelike, vivid visuals and crystal-clear details with full high definition 1080p/2160p resolution when playing Blu-ray. You can build an incredible home theater and enjoy Blu-ray feast with the Blu-ray Player app, a computer and a full HD home theater projector. If you have made a copy of Blu-ray folder or Blu-ray ISO file on your hard drive, you can load it to the program and soon you will be able to watch the movies. The whole process can be finished within a few clicks. Meanwhile, as the best DVD player, it's not only a DVD disc player, but also DVD player to play back DVD folder and DVD ISO. It's also a 4K video player to deliver extraordinary movie experience via 4K displays. It's capable of playing 4K video in MKV, MP4, MOV, MTS, XAVC, MXF etc. 1080p video in HD MP4, HD MKV, HD MOV, etc., 720p videos in MP4, AVI, MKV, etc., be it camcorder reordered footage, downloaded online video, or streamed video. As a free music player, you are able to add audio files like MP3, AAC, FLAC, AC3, WMA, WAV, OGG, etc. for playback with 7.1 channel smoothly. As a image viewer, you are allowed to open HEIC from iPhone/iPad with iOS 11. A few options will prompt out by right clicking the video like the options are including Audio, Subtitle and Titles. A satisfactory audio track or subtitle track can be selected from the menu for better movie experience. And you can adjust the screen size of this Player by adjusting the playback frame. 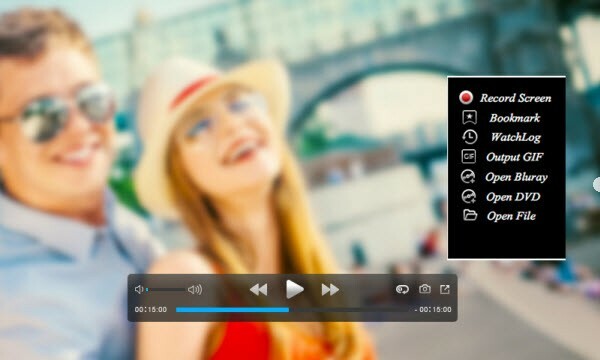 There are more exclusive functions on "Navigation panel" at the bottom of the player interface when playing movies like video looping, recording, adding bookmark, checking history, making gif, etc.. Moreover, click the "Snapshot" button to take your favorite pictures and they will be found effortlessly. Money Back Guarantee - Safe shopping. Free tech support.